As long time authorized resellers of some of the best manufacturers of automated CD DVD duplicators, GotMedia.com offers the best prices and widest range of automated all-in-one disc publishers and printers products. 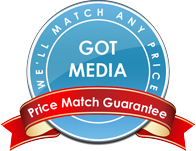 Servicing Orange County and all of Southern California, GotMedia.com provides an excellent range of popular automated cd dvd publishers from brands such as Epson, Primera and Microboards. In addition, GotMedia also represents automated duplicators from Microtech, MF Digital, Teac and Rimage, making GotMedia the true one-stop-shop for all your duplicator systems needs. We are always updating our inventory with the latest automated duplicators from these top brands, so please give us call to find the right duplicator that best fits your business needs. Also, don't forget to take a look at all of our available CD-R Media and DVD-R Media products that best works with your new disc dulicator/publisher! Epson's DiscProducer has been getting great reviews ever since it's debut at CES 2008 from both the publishing industry and from desktop users. The compact, professional CD DVD disc publisher has all the features you need to get the job done with Epson’s advanced robotics and printing technologies. Designed to burn and print up to 100 customized CDs or DVDs on demand with one set of high-capacity ink cartridges, you can create over 1,000 discs (depends on coverage). State-of-the-art and a choice of 4 or 8 drives allows the Microboards HCL Autoloader record up to 56 CDs or 40 DVDs per hour (8 drive configuration).